I scheduled myself for the Murder of a Good Man Great Escapes tour today which didn’t leave enough time to read a Flashback Friday book today, so I hope you enjoy this giveaway. 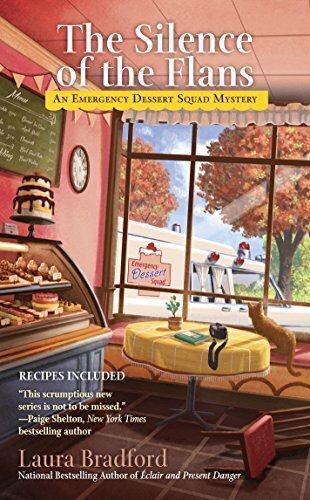 Laura is the national bestselling author of several mystery series, including the Emergency Dessert Squad Mysteries, the Amish Mysteries, the Jenkins & Burns Mysteries, and the brand new Tobi Tobias Mysteries. She is a former Agatha Award nominee and the recipient of an RT Reviewer’s Choice Award in romance. When she’s not writing, Laura enjoys making memories with her family, baking, and being an advocate for those living with Multiple Sclerosis. Pin this giveaway on Pinterest for 3 Bonus Entries. Thank you for telling me about “The Silence of the Flans” by Laura Bradford. Appreciate the giveaway and the chance to win a copy! These look like some fun cozy mysteries!